You’ve crash landed on a tropical desert island and theirs a tribe coming for you, so why not play slots and bet your way through volcanos and palm trees to locate buried treasure and trigger free spins in this jungle fueled 5 reel slot game. For more details, click to see UK slots. NetEnt (short for Net Entertainment) is known not only for their highly anticipated slot online games, but also for their pioneering attitude towards the industry itself. You can read more about this developer as they also lead by example with cutting-edge titles such as Copy Cats and Hansel and Gretel. If you were stranded on an island what would be the one thing you’d bring with you? 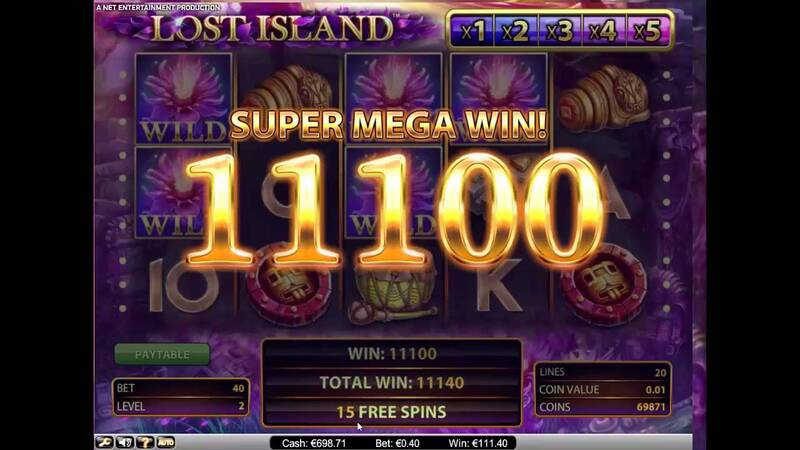 What’s that, you’d bring slots to play like Lost Island, that’s a really good idea! 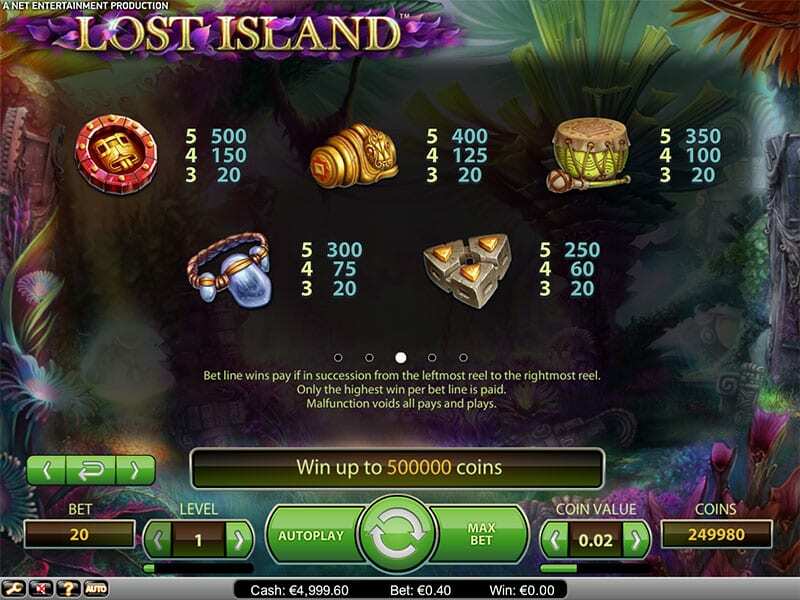 Lost Island Slot takes place on a remote — formerly inhabited — island where many of the past tribesmen treasures just waiting to be discovered. This NetEnt slot is very big on mystique, the background of this game looks like a mix between a cave and the start of what was once ruins. Colours are bright and flowers line the outskirts of the game in a very ceremonious fashion. 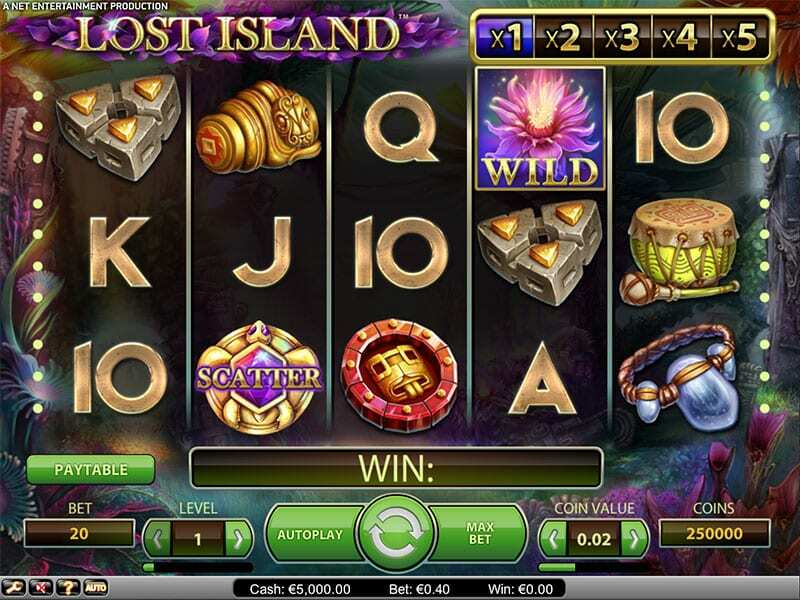 Lost Island Slot plays a classic 5 reels over 20 pay-lines. Symbols for the game are representative of the theme of the game itself, there are 5 main symbols that consist of a triangular stone, a blue gem necklace, a green drum, a golden artefact and a round mask. 10, J, Q, K and A make up the lower values on the board. Play the best-rated online slots at Wizardslots today! Keep your eyes peeled for Lost Island Slots wild: a glowing purple flower that has the same effect on the rest of the board as other games with the same kind of wild: matching the wild will substitute all other symbols except for the scatters. Additionally each wild you land will increase the multiplier for any win to which it contributes by 1x. Scatters take the shape of golden turtles that have a golden gem lodged in their back. A scatter that is very distinct from the other symbols out there in similar games. To unlock free games you must match at least 3 of these turtles on any reel. You will earn 10 free spins when matching these turtles. During these free rounds, you will have more chances to win as a wild will be placed in the centre position of the board to help you in reaching a much higher payout. Wilds may also appear stacked during the spins which means they appear on top of each other, giving the player even more reason to look out for those darn golden turtles! If there’s one thing that should be taken away from Lost Island Slot is that it’s a diamond in the rough in more ways than one! Why not also try our Genie Wild slots game.